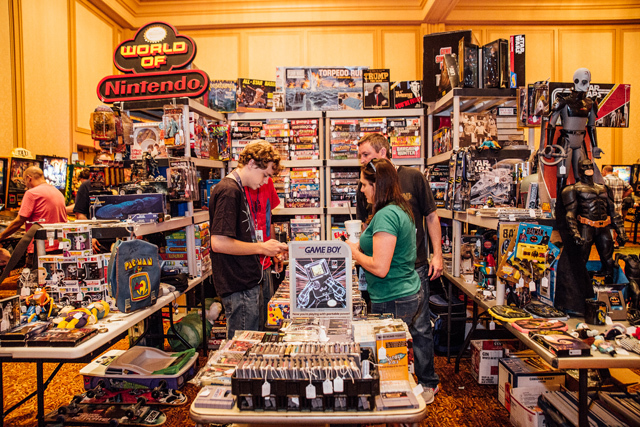 We are actively searching for vendors of all types of pinball and classic arcade games, parts, tabletop, gameroom items and collectibles to display at the Southern-Fried Gaming Expo. Because this is the only show of its kind in Georgia, we are confident that it will be a great opportunity for our vendors to meet and sell to the mid-south’s active community of arcade and pinball enthusiasts. Georgia and our neighboring states make up an exciting geographic area for hobbyists and collectors! You can now apply to be a vendor by completing our online vendor application. If approved, you will receive an invoice for your space. Payment of the invoice guarantees your spot. We reserve the right to restrict vendors that do not directly fit with our show theme or do not work within restrictions of our space. Game Developer Tables are restricted to small companies with a limited number of their own developed games to sell. The tables do not allow resales of products outside their own. Each vendor package contains (2) show badges. These badges grant the bearer access to the show hall during all pre-show and post-show hours (unless specifically noted as VIP Only). We are unable to provide more vendor badges than are provided in each package. Vendors may choose to purchase standard attendee badges at the time they pay for their package. Contact Shannon at 404-932-7562 for details. Only show staff, vendors and game deliveries will be permitted in the show hall prior to 4:00pm on Friday. The show hall will officially open at 4:00pm on Friday to ticket holders. Blocking visibility of other exhibitors with merchandise or signage is prohibited.